The markets moved higher last week despite recurring concerns about a slowdown in global growth and the likelihood of a U.S.-China trade deal getting done. 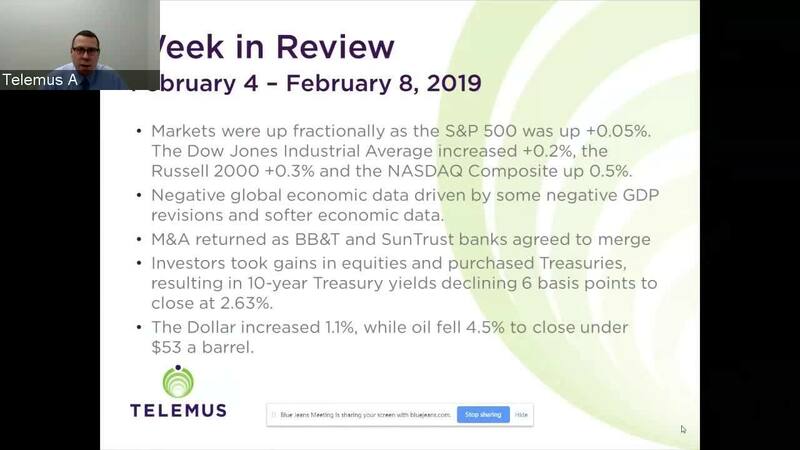 The S&P 500 was up fractionally, gaining 0.05%, the Dow Jones Industrial Average gained 0.17%, the Nasdaq Composite gained 0.47%, and the Russell 2000 gained 0.29%. The S&P 500 utilities, information technology, industrials, and real estate sectors were last week's leaders. Conversely, the energy, materials, and financial sectors were the laggards. The stock market kicked off the week right where it left off: with gains. Shares of mega-cap stocks helped prop the S&P 500 back to its 200-day moving average ahead of President Trump's State of the Union Address on Tuesday night. President Trump's speech didn't move the market, but the fundamental issues of a slowdown in global growth and a U.S.-China trade deal did cause some investors to decide they’ve had enough and take some gains. Though these concerns were nothing new, they did provide an excuse for some investors to de-risk from a market that perhaps has rallied a bit too much from the Christmas Eve low of last year. On the global growth front some disappointing updates from Europe that stirred concerns last week included the Bank of England leaving its key rate unchanged at 0.75% and lowering its 2019 GDP growth outlook to 1.2% from 1.7%, the EU Commission cutting its 2019 euro area GDP growth forecast to 1.3% from 1.9%, and Germany reporting a 0.4% month-over-month decline in industrial production and a 1.6% month-over-month decline in factory orders in December. Earnings reports last week, led by market bellwethers Alphabet and Disney, were generally mixed and replete with disappointing guidance. Separately, there was some notable M&A news last week. BB&T and SunTrust Banks announced an all-stock merger of equals valued at approximately $66 billion, which would create the sixth largest U.S. retail bank if approved. Ultimate Software received a cash buyout offer led by private equity firm Hellman & Friedman for $11 billion, or $331.50 a share. U.S. Treasuries saw some continued buying interest last week, pushing yields lower across the curve. The 2 year yield decreased four basis points to 2.46%, and the 10 year yield decreased six basis points to 2.63%. In other markets the U.S. Dollar Index increased 1.1% last week to 96.63 while WTI crude lost 4.5% falling to $52.76 a barrel in Nymex trading.